This practical establishment offers elegant rooms with private balconies and free wireless Internet connection in the hotel lobby. 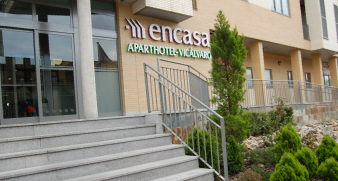 Encasa Aparthotel is just a 5-minute walk from the Vicálvaro regional trains stop and the Puerta de Arganda Metro stop (Line 9). *Our restaurant will open on December 24 and 31 from 7.00 am to 5.00 pm and on December 25 and January 1 from 08.00 am to noon.